"Creamy, cheesy, and quick . . . it's everything you need." Cook macaroni as directed on package. Meanwhile, melt butter in large saucepan on low heat. Stir in flour; cook 2 min. or until bubbly. Gradually stir in milk; cook on medium heat until mixture comes to boil, stirring constantly. Simmer on low heat 3 to 5 min. or until thickened. Add 1 1/2 cups cheese; cook and stir 5 min. or until melted. Drain macaroni. Add to sauce with bacon; mix lightly. Spoon into 1 1/2 quart casserole; top with remaining cheese. Substitute: Prepare using KRAFT Shredded Mild Cheddar Cheese. 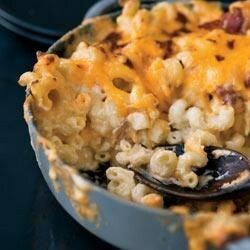 Great Mac and Cheese recipe! A word of advice though is don't leave out the bacon. It adds the amount of salt that you need for this to be as delicious as it can be. This is a good recipe - easy to put together. I realized I didn't have bacon so I sliced up some kielbasa - a good kid dish! My kids think that bacon should be its own food group, so they were all over this one. I even used turkey bacon, and they still loved it.